I'm Cynic, a 30 years vegan metalhead married with two children, 7 cats and 8 ferrets. I'm born near Lorient in Brittany but now I live near Paris (cause I fell in love with a parisienne 8 years ago). I hear all style of metal from Saxon to Wurdulak. Most of time, I avoid Nu metal en -core, excepted for bands like Heaven shall burn cause they're vegan and their sound is not so far from At the Gates and other swedish melodic thrash death metal band. 7 cats...cool! We've got 8 dogs! 8 dogs, I hope for you than they need to urinate (or more) at the same time. What sort of race are they ? Hi and thanks for this forum. Could become an interesting thing. How is it being a vegan in France? I at times found it rather difficult even to get vegetarian dishes in french restaurants. there aren't many vegs in France I think? Do you know a nice vegetarian resataurant with vegan dishes in Paris? The last I've been to was called "Grenier de notre-dame". I think I had some vegan plate there, but I don't know anymore. It's not always easy to be vegan in France, even if things are changing. If you live in big town like Paris, you can find veggie restaurant and veggie shop, but in little town, it's always difficult. Now, in mostly supermarket, you can find Tonyu, Tofu and "Soya Steack". But infortunately, it's often the must expensive brands. So if they're no bio or veggie shop with more brands and more choice, you can cry ! In add, In France, there's no french vegan label and the european V-Label is seldom. So you have to read and verify all before to buy, it's very boring. I don't know if there's the same problem in other country but in France, you can just buy vegan producst in singly or in small quantity when the Ghouls can buy their frozen steaks by 10, so it's obviously not the same price. So the supermarkte situation is not that much differnet from Germany, I don't know an official vegan label here too. But at least, you now get soy milk in almost every dicounter, I think the situation improves a lot. But how do people feel about vegans in France? A strange sect Oh, and I always thought that the german would be so intolerant... Once, a friend asked me if straight edge would be a sect, but vegan people are mostly admitted in germany. To our dogs: We've got three wire-hired dachshunds, one german shepherd, and the others are hybrids: a German Shepherd-Hovavart-Bernese mountain dog mix, a jack-russel-cairn terrier mix, a dachshund-miniature pinscher mix and another jack-russel-mix. We "bought" the dachshunds and the shepherd (I hate the word in this context, it sounds as the dogs would be a product, but I don't know how to say it in another way), but the pinscher-mix and the cairn terrier-mix were marooned in front of our frontdoor. We didn't have the heart to bring them into a pound, so we received them. 25 millions animal are abandonned in a year, 6000 are killed by euthanasia each day. In France SPA lies about number of Euthanasia. I think it's stupid. If they go on to let believe that abandonned animals always find a home, how can they reduce abandon. I think I will open a topic for our animals, Beautiful photo are better than a description of the race, you are right, they is not products. Describing just character and their stories, let us leave the rest to the fan of the LOF, LOOF and the other industry of living being's sale. I'm also always very confused and annoyed when people say that they are so kind to animals, but than they buy a rabbit, or a guinea-pig or a bird, and put it into a small cage, alone! Perhaps the animals are an alternative to children or something different, but a human can't replace an animal! It's also not a toy or a christmas present! So much people treat pets as a changeable object...Horrible! To my mind, pets should disappear. Be at the mercy of Mankind, it's like play at the russian roulette. Yes...it would probably be the best. The german word for pet is "Haustier". Word-for-word: "Houseanimal"! The humanity enslaves animals just for the own interests, repress their natural behavior pattern and takes them their freedom. But sometimes I ask me how blind a person can be. Are they all closing their eyes or are they really all so stupid and ignorant?? There are some persons who call us mad too; not just because of the dogs, but because we also care for rabbits and guinea-pigs that anybody put in front of our door like useless rubbish. Some even put food into the box. But that don't change that they escaped from the responsibillity. Yes, the pet thing, I'm against that too, at least trading animals in zoo shops should be forbidden. I always get agressive seing birds in cages when going to the garden market (whatever this is called in english). How can people feel okay about that? Once you thought about it, it seems so obvous taht this is wrong. I've been raisng orphant wild animals with my family at times, that's a beautiful thin. You have contact with animals wich IS wonderful, but you let them go when they're ready, and it doesen'T break your heart to have them leave you, there are always new ones wich need help. There's so much we can do for animals without having to produce them solely to be able to put them in cages. Yes, that's really a senseful thing. Once, I found a swallow on the schoolyard with some friends. The bird lay on the ground and didn't move, but was still breathing. I took him home and we put him into a cage to look if he would get well again and after some hours, we could set him free. It was great to see him fly away. A few weeks ago, we found a Hedgehog with a disturbing red spot. We thought it was injured but it was just painting. We kept it in observation a few days then free it in border of forest because we found it between a main road, a highway and a construction site. Not a good place for a Hedgehog. Recently, someone has given to us a stone marten baby. Some stupid people have touch it and once touched, its parents abandon their children. 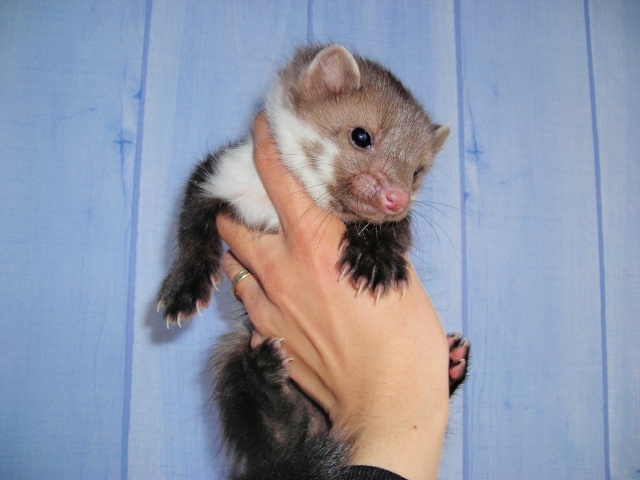 I don't think we can free it because most of people who took care a stone marten baby have never manage to free it. Their stone marten always came back. People confuse ferrets and stone martens, they believe to save an abandoned domestic ferret but in fact they condemn a wild animal. How can we confuse ferret and stone marten ???? Stone Marten, my favorite animal ever ! !